I got my first journalism job when I was 20, as a reporter-intern at “City Lights,” the Jerusalem Post weekend supplement in Tel Aviv, where I published several features and human-interest stories. I also dabbled in TV for the first time, as a reporter for local television. Throughout my three-year B.A at Tel Aviv University I held several part time journalism jobs. I gained valuable experience as an assistant to two senior correspondents at “Haaretz,” Israel’s leading daily newspaper, and also began working for NBC News as an intern at the Tel Aviv bureau. Most importantly, I was a leading member of the student newspaper, where I created the foreign news column and covered local campus news, as well. After establishing myself as one of the paper’s senior writers, I became the news editor and later a columnist. Towards the end of my studies, I started working as an assignment desk editor at NBC and began to contribute articles to msnbc.com. I also had the opportunity to work with the top echelon of NBC during the historic visit of Pope John Paul II to the Holy Land. In addition, I began to hone my reporting skills at the Los Angeles Times, where I received acknowledgement as a contributor to numerous articles. After graduation, I became a true freelance journalist, working for several print and broadcast media organizations, both in English and in Hebrew. My main work was as a field producer at NBC, as the Tel Aviv based “fixer” for the LA Times, and as a sports reporter for Haaretz. During this time I was deeply involved in covering the major events of the second Intifada. My work for NBC and the LA Times took me almost everywhere in Israel and the West Bank. I was regularly dispatched to sites of breaking stories and covered dozens of suicide bombings and other attacks. I was involved in all aspects of television production and regularly contributed to pieces filed for MSNBC and all NBC news programs, including “Today” and “NBC Nightly News with Tom Brokaw.” At Haaretz, I covered the NBA beat during the 2001-2002 season. I also reported on the WNBA, NCAA basketball, baseball, tennis, golf, extreme sports and many other local sports. At this stage I decided to fulfill a long time ambition of returning to the U.S. and also take the next step in my career by enrolling at the Columbia Graduate School of Journalism in New York City. Here I took my writing and reporting skills to a whole new level and enjoyed the guidance and tutelage of some of the best in the business. Once in New York, I was assigned to cover the Bronx. My stories covered several beats and topics with articles ranging from profiling a homeless junkie to reporting on a Presidential candidate and covering murder trials to exposing the demise of the last synagogue in the south Bronx. My most comprehensive work of the year was a 6,500-word piece about the evolution of the Bronx Zoo. Several of my news features were published in the Chicago Tribune, San Diego Union-Tribune, Arizona Republic and The New York Daily News, among others. I was awarded honors in the fall core course, Reporting and Writing I, and in the spring core course, Personal and Professional Style. I also honed my television anchoring skills by delivering the financial newscast at forextelevision.com. In the fall, I moved to Canada where I became a staff reporter for the Ottawa Citizen. In Ottawa, I covered hundreds of stories that appeared in all sections of the newspaper: World, Canada, City, Arts, Sports, Business, Opinion, Tech Weekly and The Observer, the weekend supplement. My work also took me to faraway places such as northern Ontario, Winnipeg, New Brunswick and Israel, where I was sent for three weeks to report on a series of long-form articles. I got to write a wide array of articles, both breaking news and features, ranging from covering President George W. Bush’s visit to Ottawa to the 60th anniversary of the liberation of Auschwitz and reporting on the Mount Everest expeditions of five climbers from Ottawa to the life and death of ABC-anchor and Ottawa-native Peter Jennings. 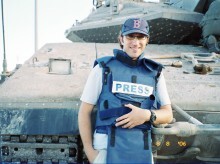 Following a year in Ottawa, I returned to Israel to take a correspondent position at the Associated Press in Jerusalem.